Life abounds in the Maine woods. When I first visited this great state, I quickly was intrigued by how little patches of forest clearings shot up with young pines and spruces. Every inch of the ground seemed to be covered with plants. Here at Little Pond, trees will grow anywhere, including on top of rocks, on top of dead logs, or any other place they can get a foothold. Yesterday was gray and breezy, and the temperatures dropped to the low 50's by sunset. Rain overnight, and gray again, but calm and still, which makes for much better wildflower photographs, as the flowers themselves move slowly back and forth in even the most gentle breezes. We're about ready to head to church, a classic white clapboard variety, the one where Megan I were married in 2006. I always love meeting and talking with Mainers, they always have something interesting to say. This is an amazing example of survival of the fittest. Correct me if I am wrong, but with my eye that picture looks like a tree growing on top of a tree that has fallen. Stunning photos as always! 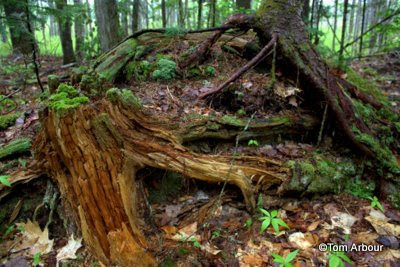 Thanks Ellen, yes, first a rock, then a dead tree, then a live tree growing over the dead tree and the rock. Mary- The forest here is amazing, the will the plants have to survive in grow anywhere always fascinates me.